As early learning professionals, we do our best to understand and teach young children with special developmental needs. Serving children with Autism Spectrum Disorders (ASD) is a new frontier for many of us. 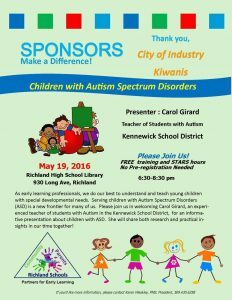 Please join us in welcoming Carol Girard, an experi-enced teacher of students with Autism in the Kennewick School District, for an informative presentation about children with ASD. She will share both research and practical in-sights in our time together! Thank you, Tricity Industry Kiwanis for supporting professional development for early education and early care providers. Read 20 Minutes every day! Partners for Early Learning is committed to ensuring that all young children come to school with the skills and resources needed to succeed.